Memorial, new to city cemetery last year, serves as centerpiece for Veterans Day fete. HALLOWELL — There are five McPhersons on the veterans memorial in the city cemetery. Harold served in World War I. His sons, Ernie and Harry, were in World War II. Another son, John, was in Korea. Harold’s grandson, Scott, served in Vietnam. They all made it home. On this Veterans Day, it was Ernest who laid a wreath at the base of the flagpole near the granite memorial in the northwest corner of the Hallowell Cemetery. Ernie, a lifelong Hallowell resident who’s now 86, barely served in the war: He joined the Marines two days shy of his 18th birthday in 1945 and went to China, staying through the Allied forces’ victory over the Axis powers, including Germany and Japan, and into 1946. He would go on to serve in the Maine National Guard before retiring in 1987. Ernie played football and hunted with Samuel Bourassa, just months, he said, before the Marine private from Second Street was killed at Iwo Jima in 1945. He was 18. Ernie knew David Fuller, a Marine private first class from Winthrop Street who died in Saipan in 1944. In grammar school, Ernie said he got in a fight with Frank Caldwell, killed in Germany at 19 in 1945 — the youngest, and last, of three Caldwell brothers to die. Caldwell’s older brothers, Maurice and Cecil, died on the same day: June 28, 1943, in the Solomon Islands. They were 21 and 24, respectively. 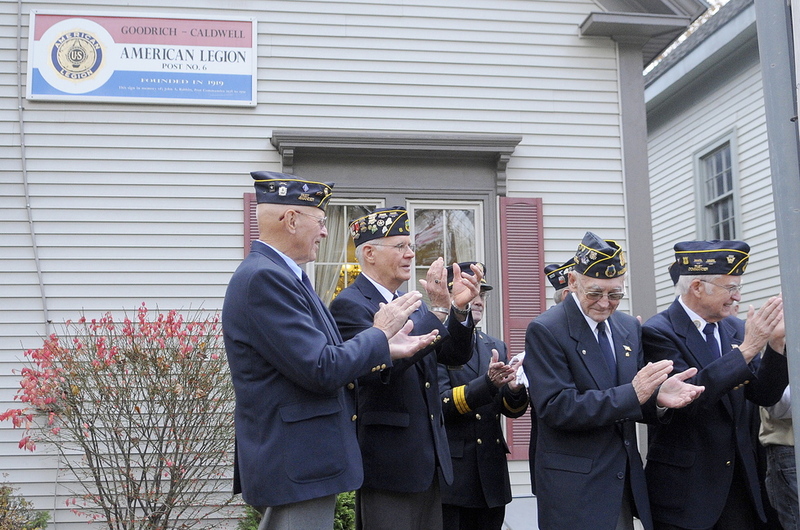 The city’s American Legion post, Goodrich-Caldwell Post 6, would be partially named for the family. Before that, it was named only for Frank Goodrich, a Hallowell native who moved to Canada and became a fighter pilot for the British in World War I. He was killed in aerial combat in France in 1916. Before Ernie served, at 16, he joined a Maine National Guard troop that would travel around the state to dedicate war memorials that were built early in the war. They would also march on Memorial Day. He said the services were solemn then — Hallowell’s Baptist church would have ceremonies each time a city soldier died, he said, and many would attend. In 1945, a wooden sign that served as the city’s war memorial was put up at the city’s post office. It was replaced in 1993, but it started to deteriorate in recent years. 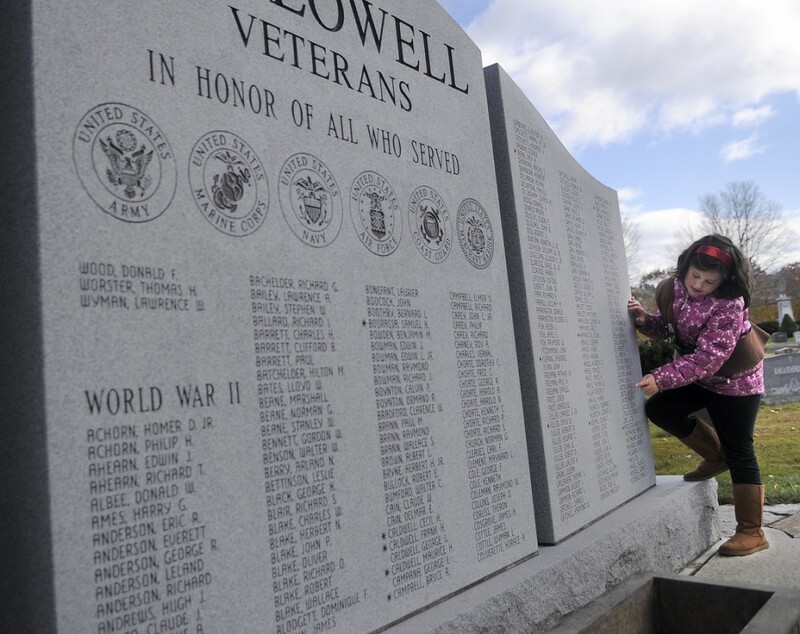 So last year, behind $30,000 of private money, Hallowell’s Legion post put up a six-foot-tall, 15-foot-wide granite memorial in the cemetery. Built by Provost Monuments of Benton, it bears more than 650 names of Hallowell veterans from the Spanish American War through Afghanistan, with room for more. On Monday, it served as the centerpiece for the Legion post’s Veterans Day celebration. Girl Scouts led the crowd in the Pledge of Allegiance, singers performed “Amazing Grace” and “Columbia, the Gem of the Ocean” — a patriotic tune most popular around the turn of the 19th century — and prayers were read.